The underlying rocks are silurian shales and mudstones to the north, merging to old red sandstones in the south and the area is complicated with some latterday glacial drifts due to the ice sheets overspilling from the main Wye Glacier. 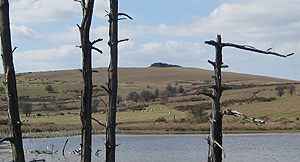 There are a few natural mawn pools which can dry up during the summer months and some small recently created pools which cater for the animals grazing the common. There is one large pond, the Monks Pond, which has been enlarged in recent times to provide a reliable year long water supply for the Perthiduon farm. The vegetation is mainly rough grassland and bracken, with a fair scattering of cotton grass, gorse and some resilient hawthorn trees. There are also some heather patches in the more peaty area by the two mawn pools to the west of the Roundabout. 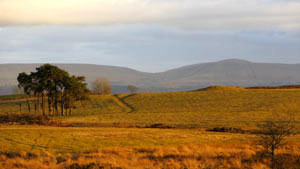 The farms surrounding the Begwyns have possessed varying common rights since medieval times depending on their deeds. These are in the main pasturage, estovers and common in the soil and the farmers themselves have mutually exercised and managed these rights over the ensuing period. At a practicing level the rights refer to the grazing of sheep, ponies and cattle, along with the cutting and gathering of bracken for winter bedding on the surrounding farms. There has also been selective quarrying of rock and the shales over a long period, some of this being used for building purposes and some to improve the various trackways where necessary. It is worth noting that both the farmers and the National Trust have been and are developing a working relationship regarding the management and preservation of the area. 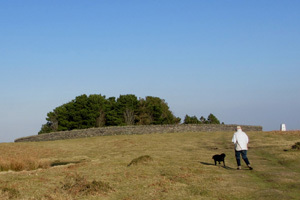 There is abundant physical evidence that the Begwyns have been occupied by man during prehistoric times and some indications for the medieval period, although at present nothing has been discovered to suggest an occupation by the Romans. There is also post medieval evidence of agricultural and wartime activities, latterday quarrying and the creation / improvement of access tracks and footpaths. Within the Roundabout lies the Begwyns Round Cairn, probably of the Bronze Age and a burial mounds of some 11m in diameter which has been much abused over the years by grazing animals, human traffic and tree planting. It is now a Scheduled Ancient Monument (S.A.M.) with a protected area of 22m in diameter. This is a well constructed ring and possibly a burial cairn. It is 7m across and encircled by a stony bank up to 3m wide and 1m high. The protected area is a circle of 15m radius. This is a large split stone of just over a metre high and a metre wide. It is nearly 0.5m thick and has a 8m diameter protected area. 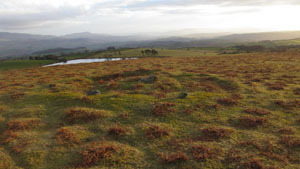 Along with 11 other lesser sites the four above are considered to be of the Bronze Age and all but one, the Maesgwyn Round Cairn, are located in the northern half of the Begwyns. The reason(s) for this are not fully understood and could be topographical, geological or to do with the climate at the time, which was decidedly more temperate. This site is an extensive one with several earth platforms. There are supporting stone foundations, of rectangular long huts and a number of small attached enclosures. There is also a series of larger enclosures defined by earth banks. The protected area for the site is 400 x 600 mtrs. There are a few other possible medieval sites as yet unconfirmed ( 2014 ) and they all occur in the northern half of the Begwyns. This may be due to climate or topography or a combination of these and other factors. 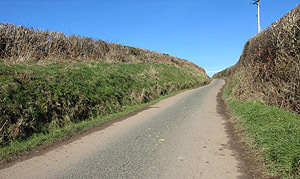 The common rights ( mainly pasturage, estovers and common in the soil ) have been in use since medieval times on the Begwyns and during this period there have been improvements to existing roads and trackways, a particular example being the road from Ffynnon-Gynydd over to Painscastle, once a well worn ancient trackway - as witnessed by the very high roadside hedges - and now a fully metalled 'C' class road. Other well used grassland tracks have been modified and consolidated with the quarried shales and some ditches have been crossed by 'Clapper Bridges' as the one at GR 149443. 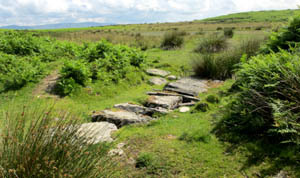 This ditch was possibly used to drain the area of the two mawn pools above the bridge in order to improve the grazing. This .area is shown on the 1832/33 OS map as being one large lake ( similar in size to the Monks pond ) and is still quite boggy during the winter months when water egresses out of the now shallower ditch.
" Wales ", A Physical, Historical and Regional Geography. Edited by E. G. Bowen, M. A. F.S.A. National Trust archival material and reports.